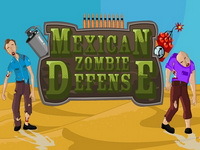 Description: Zombie Tower Defense 5 features fun strategy and zombie carnage. Sit back, relax and destroy the zombies as they attempt to make their way through the maze. ZTD 5 has tons of new features, maps, zombies, towers, sounds, graphics and more! Instructions: Use your towers to kill advancing zombies before they reach the end of the path. You will lose one life for each zombie that escapes.